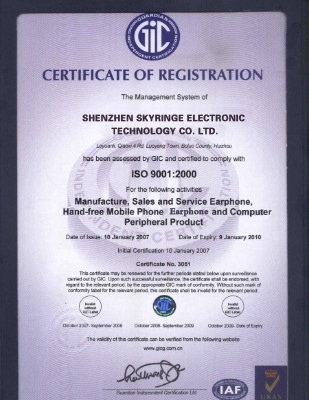 Company Overview - Shenzhen Skyringe Electronic Technology Co., Ltd.
Shenzhen Skyringe Electronic Technology Co., Ltd.
7YRSShenzhen Skyringe Electronic Technology Co., Ltd.
Skyringe Company specializes in developing and manufacturing different kinds of earphone and headphone, such as bluetooth headphone, bone conduction headphone, throat earphone mic, children headphone and aviation headset etc. Our company locates in Shenzhen, and it is close to Shenzhen Airport. Our factory was built as a industrial park with an area of 2000 square meters over 300 staff. Because we set up R&D Department and sell central in Shenzhen for layout development and we are going to apply value-added tax qualification. We registered this company. The direction of our goal mainly leans to sell, separated as two parts: domestic and international clients. Our international clients are mostly distributed in over 50 countries and regions. As far, we mainly focus on European clients, such as HELLOKITTY,TESCO, DISNEY. PHILIP and CASINO,CARREFOUR; We cooperated with these core clients, like BYD, CHINAMOBILE ,CHINAUNCOM, Hi-Tech Wealth China and Haier in domestic. The sales and service sum in 2010 reached to USD 7,600,000. We plan to catch up with developing tide of worldwide audio frequency technology and have more experienced technology in wireless headphone field. 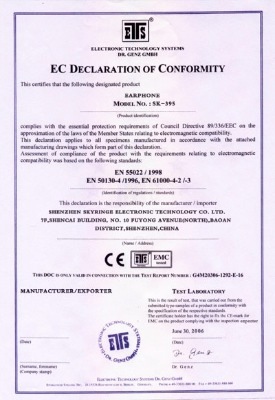 Until now, we own injection molding, molding development, oil injection, pad print, peaked design and assembly; in the meantime, and have CE, FCC, RoHs authentication as well. We keep our principle technology and innovation. We are devoted to becoming outstanding manufacturer in professional audio frequency solution project in world. 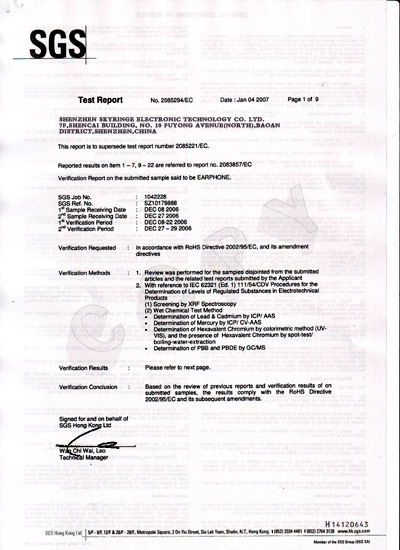 Issued by Guardian Independent Certification Ltd.